The Central Bureau of Investigation on Monday arrested two persons in connection with the Income Tax department's recent seizure of Rs 5.63 crore in new currency notes from several individuals in Bengaluru which was allegedly diverted by an ATM servicing company in criminal conspiracy with bank officials. CBI sources said the agency arrested Nazeer Ahmed and Chandrakanth Ramalingam who were named in the FIR registered by it. Both were presented before a special court in Bengaluru and have been sent to five-day CBI custody. The sources said more arrests could be made in connection with the case. Meanwhile, the agency said it conducted searches at 10 locations in different places across Bengaluru including the residences of bank officials, some private persons, offices of Karnataka Bank, Dhanalaxmi Bank and ATM servicing company. CBI spokesperson Devpreet Singh said several incriminating documents, computer hard disks, applications along with the ID proofs submitted to the bank for exchange of Specified Bank Notes and vouchers through which money was withdrawn have been recovered. “Scrutiny is on to compare the cash received from RBI and disbursed by the bank etc,” she said. The CBI and Enforcement Directorate have registered cases in connection with the Income Tax department's seizure of over Rs 5.86 crore from four individuals, out of which Rs 5.63 crore was in new currency notes introduced post-demonetisation, agency sources said. It is alleged Suryanarayana Bairy and Umashankar Renuka, managers of Karnataka Bank and Dhanlaxmi Bank respectively, entered into a criminal conspiracy with private individuals and an ATM servicing company Secure Value India Limited to ‘dishonestly and fraudulently’ facilitate exchange of demonetised currency with new notes, they said. The managers used the ATM company to divert new currency meant for 32 ATMs of the Bengaluru city to the individuals who wanted to convert their currency bills of Rs 1,000 and Rs 500 which ceased to be legal tender on November 8, it alleged. Individuals Ibrahim Shereef, Jaychandra, Nazeer Ahmed and Chandrakanth Ramalingam have also been named in the CBI FIR for allegedly using the services of bank managers to convert their old notes with new ones. It is alleged that the bank managers diverted the new currency notes by falsifying bank accounts on the basis of forged and fabricated documents of identity and address proofs in the name of several individuals to camouflage these exchanges as genuine transactions. The CBI has alleged in the FIR that that Renuka handed over Rs 1.30 crore to Secure Value India Limited between November 8 and November 29 which was meant to be deposited in 32 ATMs in Bengaluru, but the company wilfully diverted it to Shereef, Jaychandra, Ahmed and Ramalingam, besides others. It is alleged that Secure Value India used a network of agents and middlemen to help individuals convert their currency notes on a massive scale. The sources said the CBI has slapped charges under Indian Penal Code sections related to criminal conspiracy, cheating, forgery among others, besides provisions of the Prevention of Corruption Act against Bairy, Renuka, Secure Value India, Shereef, Jaychandra, Ahmed and Ramalingam and some unknown people. The sources also said the Enforcement Directorate has registered a separate case under provisions of the Prevention of Money Laundering Act on the basis of the CBI FIR to probe the flow of ‘proceeds of crime’. 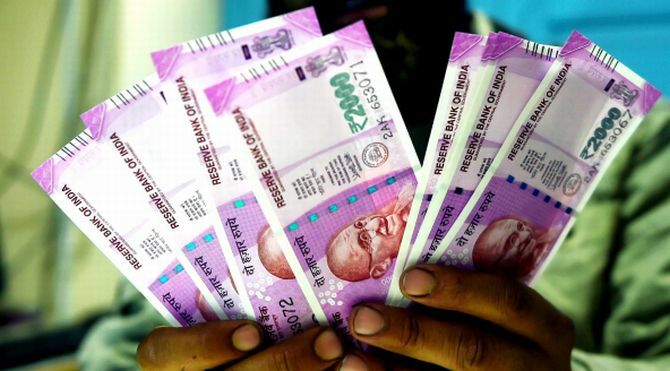 In the biggest-ever seizure of cash in new currency on December 1, the Income Tax department had unearthed over Rs 5 crore even as it detected unaccounted income worth Rs 152 crore during searches at a dozen premises in Bengaluru and other locations. The Income Tax department had carried out searches and recovered Rs 5.17 crore from Shereef which included Rs 4.80 crore in new notes, Rs 25 lakh from Jaychandra of which Rs 5 lakh was in new currency, Rs 44 lakh from Ahmed with Rs 32.70 lakh in new bills and Rs 46 lakh in new currency notes from Ramalingam.